Here's a look at my weekly pages for week #30. I highlight doctor appointments in pink so I can easily go back through the calendar at tax time and calculate out my medical mileage. I use the Martha Stewart tear drop labels for reminders of tasks that don't happen on the same day of the week - so it's harder for me to remember the tasks. For example, Monthly goals on the last Sunday of the month, giving my dogs heart-guard on the 15th of the month. I also have to track medical tasks which happen every three or four days, so it makes it easy to track. 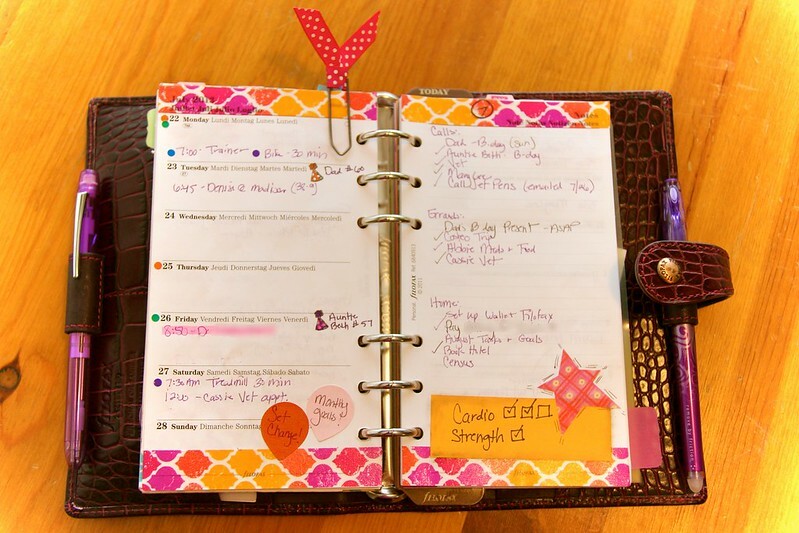 The notes pages hold tasks by context (Calls, Errands, Home). At the bottom of the page I put my goals for the week. This week I put them on a sticky note so they'd really stand out. I like how that worked, so I may do that again in the future! I tried out the new Scotch brand washi tape and I really like it, I'm able to write on it with a marker (at the top of the page I'm counting down the weeks until I'm on my beach vacation!). I love the bright pinks and oranges of this particular tape, it's so vibrant, I'll definitely be buying more Scotch washi tape.